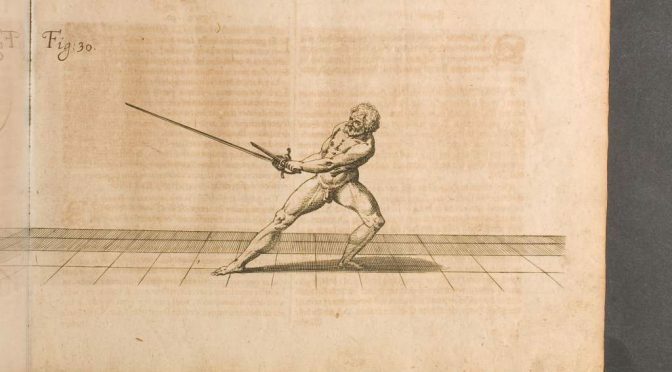 So last night in our private lesson class we worked through Plate 30 of Giganti, which is the “Deceitful Guard that Leaves the Left Side of the Body Open”. Giganti’s instruction is to leave your left shoulder uncovered so that the opponent may attack you there. He also previously stated that in a deceitful guard we open one line whilst defending the others, in other words we set ourselves in a guard of invitation. When I teach this guard, I start in our primary guard of Terza, and then rotate my forearms / hands anticlockwise so that my sword hand turns into third in second forming the invitation of 3rd, and my dagger hand turns into 3rd in front of my right hip / flank. Be careful you don’t leave the sword point online, as this is not a defensive guard but an invitation guard! With the point in line we’ll never draw the attack to the inside line that we are hoping for, nullifying the purpose of this guard. We must completely close our high outside line. I call this the Right Deceitful Guard for short, or the Invitation in 3rd. I love the instructions that follow on the actions that follow, as it really forces the students to think about and incorporate all their understanding of the system to get all the nuances out of the instructions. Typically my students get the core concepts from the plate but they miss the subtlety of the timing in some of the actions, so they miss about half the actions we can make from each plate. Giganti says You can advance on the opponent and, as you arrive in measure (while the opponent is still waiting) you can strike him in whatever opening he has. Agent in the Right Deceitful Guard, Patient in Guardia Terza starting from out of measure. Agent advances into measure, and as they come into Lunge Measure they lunge extending their weapons forward, gaining the opponent’s sword in their high inside line, hitting to the Patient’s high inside line. Patient retreats back out of measure. Agent in the Guardia Terza, Patient in Right Deceitful Guard starting from out of measure. Agent advances into measure, and as they come into Lunge Measure they lunge extending their weapons forward, closing the high inside line, attempting to hit to the Patient’s high inside line. Patient extends their weapons into the high inside line to parry, and then leans in with their body to hit with a firm footed lunge. This first version works best against someone who tries to gain the line as they are lunging, since they haven’t completely closed the line as they initiate their lunge. 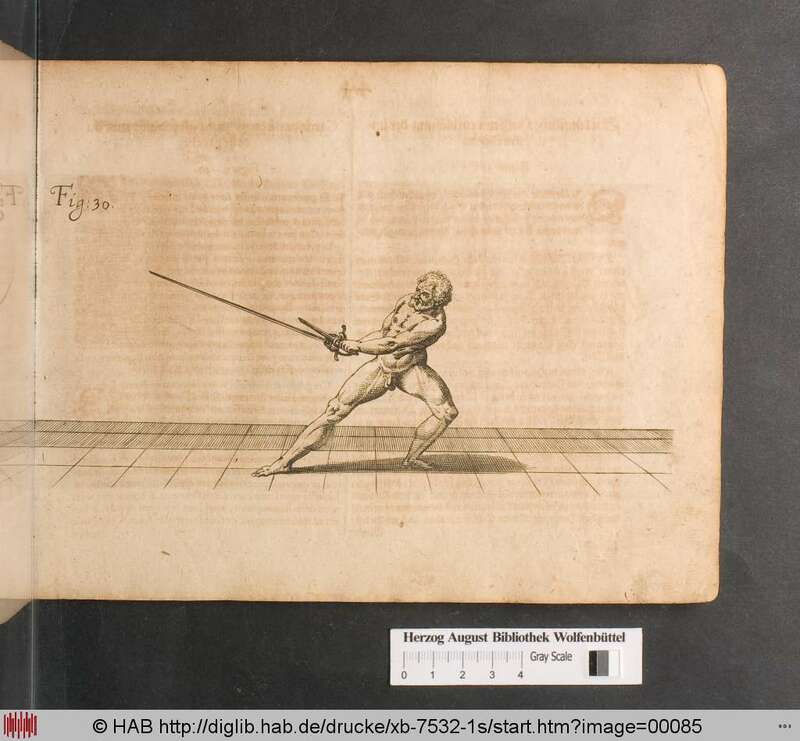 Against someone who first closes the line the drill becomes Giganti’s initially described version where the single tempo parry is done on the advance of the sword foot. Agent advances into measure, and as they come into Lunge Measure they extend their weapons forward, closing the high inside line, and then lunge attempting to hit to the Patient’s high inside line. Patient extends their weapons into the high inside line to parry, leaning in with their body on the parry, and continue the forward movement to hit with a lunge during the recovery of the Agent. The second version can also be used as an attack into the preparation, where we launch the single tempo parry riposte on a lunge when we see the Agent moving their hands to close the line. This drill teaches the setup for the parry and feint response, which we look at in the next drill, and is the basis for the subsequent drills. The key part is that it teaches the double tempo parry riposte, with the first tempo being the parry, and the second being the riposte. The advantage of the double tempo parry riposte is the extra security we gain from the 2 weapon parry and the slightly extended tempo which can use to keep ourselves safe. The disadvantage however is the extended tempo, which affords the opponent extra time with which they can counter our response. Patient extends their weapons into the high inside line to parry, keeping their body withdrawn on the parry. Patient ripostes with their sword to the Agent’s abdomen with a thrust by cavazione, or to the Agent’s face with a thrust by glide. The riposte is either done with the firm footed lunge or the lunge depending on the measure required at the time of the riposte. Continuing from Drill 3, the students will experience a failure rate with the riposte by cavazione, as the Agent will have a tendency to parry this riposte with their dagger. This dagger parry is the one that we defeat with the riposte by feint. One of the key things the stuydents need to understand is that during the riposte by feint, they must maintain the engagement of the Agent’s sword with their dagger to keep themselves safe. This forces their brain to switch to defensive mode, and they solely concentrate on defending themselves with their dagger. Patient ripostes with their sword making a feint by cavazione (clockwise) to the Agent’s abdomen, drawing the Agent’s dagger parry of 2nd. The Patient then evades the dagger parry with a cavazione to the high line hitting to the face or chest of the Agent over the top of their dagger arm. This one also work with a Lefty vs Righty, except the feint is now to the flank, and the riposte is to the sword armpit. The use of the pass builds on our double tempo parry riposte action, however this time the riposte is made with the transport to 2nd to set up the thrust to the flank on a pass. The advantage of this riposte is that we are now moving away from the Agent’s dagger, but the tempo of the riposte is longer than the previous drills. Patient performs the transport from 4th to 2nd with their sword, whilst maintaining engagement with their dagger. Patient ripostes with thust by glide to the Agent’s flank, using a left foot passing step, maintaining engagement with both sword and dagger. Note: Against a Lefty, as you make the riposte by glide extend your dagger at the Agent’s dagger hand! This will keep you safe from the dagger counterattack. Giganti says If the opponent, as you stand in guard, launches a two-tempi attack on you, you can either parry and strike in one tempo or also in two – then immediately recover out of measure. Agent advances into measure, and as they come into Lunge Measure they extend their weapons forward, closing the high inside line, and then feints a thrust to hit to the Patient’s high inside line. Patient extends their weapons into the high inside line to parry, keeping their body withdrawn on the parry, to setup a riposte. Agent performs a cavazione (clockwise) to evade the parry and hits to the Patient’s flank or face on a lunge, covering the Patient’s sword line with the dagger. Agent recovers back out of distance. Now we’ll perform the response to the action in Drill 6. The response here is the counterthrust during the tempo of the Agent’s cavazione, a concept which Giganti taught us in Plate 5. The feint diengage attack used by the Agent is the two-tempi attack described by Giganti above. Agent performs a cavazione (clockwise) to evade the parry and attempts to hit to the Patient’s flank or face on a lunge, covering the Patient’s sword line with the dagger. Patient turns their forearms back into the Right Deceitful Guard to close the outside line as they continue their lunge started in step 3. This will intercept the Agent’s sword before they can complete their thrust by cavazione, allowing them to be hit in the face. Patient recovers back out of distance. There are many other drills we can setup from this Right Deceitful Guard, and Giganti tells us as much when he says we can do anything you can do from another guard with which we have experience. It’s a great guard for teaching a whole lot of basic principles, and even some advanced ones. I’m sitting here after AWMAC 2018 feeling very despondent, and it’s taken me most of the day to realise what the problem is. I’m feeling like a failure because I barely did any fencing over the 3 days of AWMAC, a conference in which I did most of the prep work in the lead up to it! I only bouted with 2 people over the course of the event, and for some reason it’s making me feel like a failure, and the feeling has been there gnawing at me for weeks. Stopping to think about I really don’t consciously think I’m a failure because of the very successful event we ran. We got 150% turnout compared to AWMAC 2016, and we got people from all across the country, and 1 guest from Singapore! Everybody complimented us on the event, and the number of times I heard “don’t thank me, thank Rick because he stepped up and just made it happen!” I also happened to run the most populated class throughout the event (Marozzo’s dagger presa) which had around half the attendees turn up for. Totally unplanned and unexpected, since we all expected the longsword class in that time slot to be the popular one. That there is I think my clue for what is going on. I am a chronic introvert. Conferences are a personal nightmare, with the expectations of networking, small talk and chatting, basically interacting with lots of people, and I’ve become exceptionally overloaded with human interactions over the course of the event. There are 4 things that stand out for me from the event, my 3 classes in the schedule, the private lesson I gave to the Singapore chap, and Matthew Boyd’s English Wrestling class. What do you notice about these things? Most of them are when I was in control of the situation! In the 2 group classes, and the private lesson, I’m the one controlling the social interaction. I’m able to manage my emotional energy so that it’s not being bled dry, and I get a lot of satisfaction coming back to me as I see people just get it during my one-on one work with people. The wrestling class was just me and and a friend working together having fun learning some new cool material. Again a controlled emotional energy set up. The rest of the time it felt like it was too much work to interact with people. Somewhere along this fencing journey, I’ve become not a fencer, but a fencing teacher because it’s so much easier to control my emotional energy levels! My introvert nature is actually my secret weapon, and most successful tool. The deep thought and quiet contemplation of what I’m reading and researching to develop a holistic understanding of the material, and the constant reflection on what I’m doing have all gotten me to this point in my fencing career. It’s why I can just watch someone and point out an issue they are having, and help them fix it to become a better fencer. (For example, many people had a lot of problems in spadone because their leading hand was gripping the sword too tightly.) I’ve gotten amazingly good at the whole teaching thing apparently, which I never expected would happen, but somewhere I lost my joy of just fencing. Maybe I’m over analysing everything and always feel like I should be on as a teacher. Maybe I’ve just untrained my ability to read the opponent when I’m in front of them, and replaced it with the outside observation ability I use as a teacher. I’ve always joked that fencing is like sprinting whilst playing chess, but I’ve lost my taste for it. I’ve done very little bouting in the last 12 months, and most of the time I’ve been bouting as fencing teacher not a fencer. What’s the difference you ask? Well as a fencer you try to win, but as a fencing teacher you set it up for the student to win. I do stuff at 110% of the ability of the person in front of me, so that they have a good chance to hit me if they do everything right. I’m applying pressure so that they can improve, but I’m not really trying hard to beat my opponent, just to make them work. It’s a little demoralising though as a fencer, because you always get hit a lot if you can’t switch that teaching mode off. I think subconsciously I may have been avoiding the whole bouting thing because I’m feeling very unhappy about my current fencing ability, it’s just not where I want it to be. Oh and as I said I’m an introvert, and I’m not going to come up and ask people to bout. I’ll stand around waiting for people to ask me to bout. I did have a few people ask to bout, but we didn’t make it happen. My issue was they caught me when I was busy doing something else for the event, and we never set a time to catch up, so of course I avoided it because my introvert nature was very overwhelmed by the number of people I was dealing with. So to those of you who wanted to fence with me and missed out, I’m sorry. It was all me and had nothing to do with you, or me not wanting to fence you. Looking around, I saw there were a few people like me just standing back, so it’s obviously not just me having issues. There are a few ways you can help people like me though, so here are a few suggestions. If there is someone you particularly want to fence, and they are standing off to the side – ask them quietly if they want to fence. Being invited can break an introvert out of the social paralysis. I’ll we stand waiting for people and never interrupt them. If they say they are busy, and you really want to fence them, ask for or negotiate a set time that you can both play. My introvert brain will help me avoid catch-ups, but it will also make me keep appointments. Social interactions are scary, but my sense of propriety will make sure I turn up to honour the agreement. Set up the bouting space so that people can just jump in without having to find themselves a bouting partner. I’m probably going to do this for a bouting evening at AWMAC 2019, where we divide the hall into 3 or 4 spaces for bouting, and each space will be a different weapon, and we cycle through people rather than forcing them to find a bouting partner. Make an inclusion place rather than a “challenge” space. It’s been kind of crazy to realise that I’m avoiding bouting, because it’s a lot of strain on my emotional energy. It’s also made me realise that it has carried over into my classes, which I’m going to have to redesign to incorporate more bouting into my class structure. After all we actually learn this stiff to put it into practice, and if I don’t make an environment where that happens it’s a disservice to my amazing students. Being an introvert can be crazy making at times, because the world really has become geared for satisfying extroverts. I think I need to go reread “Quiet – The Power of Introverts in a World That Can’t Stop Talking” by Susan Cain. I need to remember that my brain chemistry is different, and that I can’t just pretend that I’m the same as other people.